Analyzing or assessing a particular industry can be quite crucial while preparing for a business plan. A company needs to know about the external forces present in the industry that can have prominent influence in its business operations. The way you pursued your hobbies as a management student, making a thorough industry analysis should be one of your hobbies to flourishing more in life. In order to analyze an industry, the most commonly used theoretical framework is the Porter’s Five Forces model. 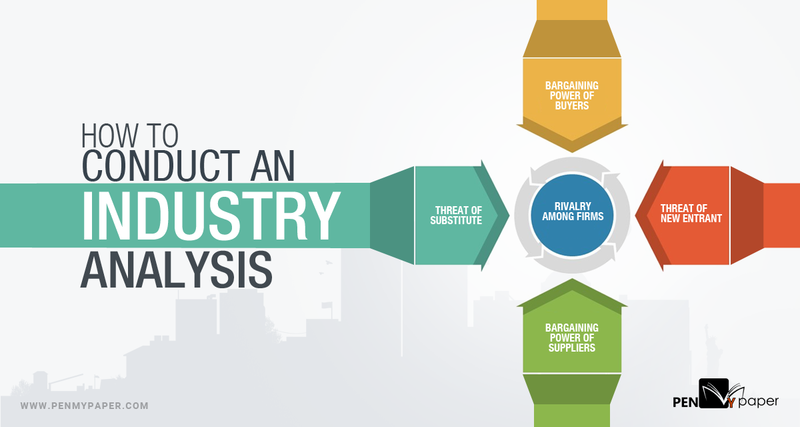 This model analyses an industry, by five different parameters, which are bargaining power of buyers, bargaining power of suppliers, the threat of new entrants, the threat of substitutes and rivalry among firms. Let’s look at these forces individually. The bargaining power of buyers is assessed by their switching cost. It determines how easily the customers can switch from one brand to another. In order to assess this external force, you need to identify the overall switching cost of the customers. Typically, it is low if they have a lot of options to choose from, which allows them to easily move from one company (or brand) to another. However, if the product offerings made by the companies are exclusive to their brands, then the switching cost becomes high, as the customers cannot easily switch to other products in the market without compromising the unique value offered by the firms. Just like you manage your creative employees to make the environment healthier, you have to work on holding onto the loyal buyers. Moreover, the switching cost can also be high based on the nature of the product. It should be noted in case of subscription-based services, the switching cost for the customers becomes quite high. This is mostly because the customers need to pay upfront for availing the services for a specific duration of time. Almost all organizations are dependent on their suppliers so that they can procure raw materials or services which is essential for them to offer the final products or services. For a specialty coffee store, they need a steady supply of coffee beans and milk. However, these suppliers can exert significant bargaining power on the firms. In order to assess this external force, the switching cost of the companies needs to be assessed. In industries, where the number of suppliers is much less, their bargaining power naturally becomes quite high. This is because the firms cannot easily switch from one supplier to another. They are highly dependent on the existing suppliers. If these suppliers choose to increase the cost of the raw materials or services, it will then have a direct impact on the revenue of the company. On the other hand, in an industry where the number of suppliers is abundant, the companies can easily switch from one to another, thereby reducing their bargaining power. Remember, if an MBA kid could escape from his corporate world and become an established entrepreneur, you also can be the one. All you need is strong willpower. The existing firms in an industry can be exposed to threats from new market entrants. However, the likelihood of a new market entry depends on the entry and exit barrier. The entry barrier can include strict legal regulations, the presence of well-established brands or high capital investment to set up the business. The exit barrier, on the other hand, can involve a high amount of working capital trapped in a business. The threat of new entrant is quite significant for the existing firms as it can increase the competition in the market. Therefore, don’t forget to conduct a thorough SWOT analysis, so reframing your business aspects can be easier for you to adopt the constantly changing preference of the customers. A substitute product or service can be anything that can offer the same the core value proposition when compared with the market players. For example, the threat of substitute in the car-manufacturing sector can come from public transport, as both of these products offer the same core value proposition which is transportation. The degree of this threat can be assessed by looking into the additional features of the products offered by the market players, which either make it superior or inferior to the substitute products. So ensure that your business strategy is the winning one that can grab the attention of the loyal customers. The companies or firms that constitute an industry is often engaged in competitive fights. Each of these market players seeks to attract a higher number of customers in order to increase their market share. Moreover, their rivalry also extends to brand image development and customer preference. The rivalry among the firms is quite common in most industries and is determined by the number of dominant firms and their business models. Each of these firms seeks to create some form of differentiation that can distinguish them from the “crowd” and can offer an exclusive value proposition for the customers. As soon as you understand the primary criteria of your business organization, you can work on developing your business concern. So get in touch with the best essay writing website and get your business plan ready at the soonest.